Located in Seaton Devon Easy to find friendly service and excellent rates. Give us a call today on 01297625050 or use the contact page to find out more about how we can help you. Get in touch to discuss your clothing embroidery and printing needs no job too small or too large. 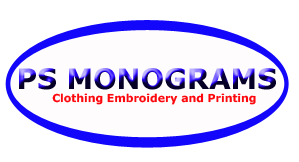 Copyright © 2019 PS Monograms Embroidery and Printing. All Rights Reserved.